London designer Marcin Rusak has created a collection of furniture and lighting by encasing flowers in resin, then cutting the blocks to reveal the petals inside. Rusak developed the Flora collection after two years of research into his combined interests in nature and materials. "I find nature to be an aesthetic master and an incredible source of inspiration," Rusak told Dezeen. "I was intrigued by the enduring appreciation of floral motifs and investigated it further." The resulting range includes a lamp, a screen and a table – all embedded with flowers sourced from local markets and stalls. The petals are set in black resin to freeze the forms, preventing them from warping or drying out. Different processes were then applied to produce a variety of effects across the collection. By cutting sheets and 3D forms from the resin, cross sections of the flowers are revealed. The effects create aesthetic qualities similar to veins and fossils, and the flowers appear to be "frozen in time". The lamp features a spherical bulb that is suspended from a brass arm at the top of a cylindrical resin base. The way the tube was cut reveals skeletal patterns created by the structure of the suspended petals and leaves. Rusak cut strips of his material and rearranged them as flat panels to form a hinged screen. Cast brass is used to form frames and legs for the room dividers, complementing the colours of the petals revealed in the sliced resin. The black resin also forms the circular top of a cast-aluminium table. Rusak produced two types of the material to create the basis of the Flora products, named Flora Perma and Flora Temporaria. The Perma variation was used for the lamp and screen, while Temporaria is the version added to the table. "The main difference is that Flora Temporaria ages, where over time petals change their volume slightly and create silver voids of light around their structures," said Rusak. "The other one – Flora Perma – is a non-ageing one," he added. "It reveals cross sections of flowers and looks much more like stone or fossil." 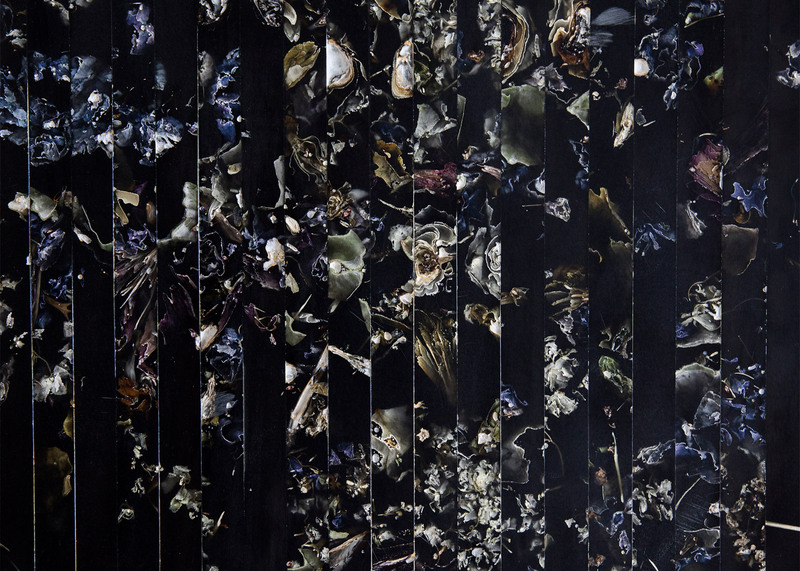 Flora was shown as part of the Future Heritage exhibition during Decorex 2015, which ran from 20 to 23 September. Rusak was awarded the Research in Making prize at the event. The designer previously presented his flower-resin experiments during the Ready Made Go exhibition at London's Ace Hotel in Shoreditch. He created chunky bangles and rings formed from dried flowers mixed with black resin. Japanese designer Shiro Kuramata also embedded flowers in resin to create his iconic 1989 Miss Blanche chair, which recently broke a world auction record.